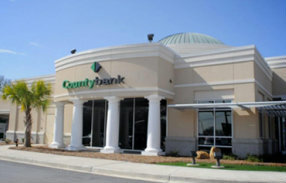 Born during the financial strife and struggle of the American economy in 1933, Countybank was developed by a group of Greenwood businessmen who banded together to better serve their community. The goal was to form a financial institution centered around the ideals of guidance, communication, and relationship building. Out of this solidarity and support, we've developed into a community bank that holds true to these principles while providing convenient, modern solutions to South Carolina's Upstate. Everyone we serve is different, and our team is committed to providing personal, customized service. Your goals and success are our focus, so you'll always be greeted by friendly faces who are willing to put in the hours to find solutions that meet your needs. We're committed to providing the best financial care while keeping the Upstate close to heart. We are an independent, locally-owned institution that finds solutions for both businesses and individuals through banking, insurance, mortgage, and trust services. No one does community-centered banking better than Countybank. Giving back to our communities and helping them grow and prosper has always been an essential part of Countybank's mission. Our associates actively support and participate in volunteer opportunities throughout the year. Some of these activities include serving as buddy volunteers each year for the Greenwood Miracle League, participating in Race the Helix, running concessions during Greenwood High School and Emerald High School football games, participating in Holiday Ice in Anderson and the Greer Station Oktoberfest, and ringing the Salvation Army bell each holiday season. We sponsor a number of community events throughout the year and donate to local, charitable causes. In addition to our volunteer work, sponsorships, and donations, we provide funding to nonprofit and charitable organizations in our local communities through the Countybank Foundation, established in 1971. In 2018, we contributed $150,000. A few examples include Anderson Interfaith Ministries, Creative Advancement Centers, Greater Greer Advancement Centers, Greenwood Genetic Center, Greenwood School District 50, Greenwood YMCA, Hospice Care of the Piedmont, Piedmont Technical College, Rebuild Upstate, The Greenwood Promise, United Way of Greenville, and Ten at the Top.